Laparoscopic hepatectomy for segment (S) 7 is classified as one of the most difficult procedures to perform.1 Here, we report a standardized method with the caudate lobe first approach2,3 which may benefit such difficult procedures. A 76-year-old woman was diagnosed with multiple liver metastases after sigmoid colon cancer resection. Her liver function was normal. Abdominal CT showed multiple small tumors located in S3 (two), S7 (two), and S8 (two). After partial resection of S3, the right lobe was fully mobilized. The caudate lobe was first divided at the midline from the caudal side parallel to the ventral central line of the inferior vena cava, and the caudate process was detached from the posterior Glissonean pedicle. Then, the S7 Glissonean branch was exposed. After transecting it, the demarcation line was secured. The root of the right hepatic vein (RHV) was exposed by further transection of the caudate lobe. The superficial tissue was divided using ultrasonic shears, while the deeper tissue was divided using cavitron ultrasonic surgical aspirator. The main trunk of the RHV was continuously exposed from the caudodorsal side, transecting the S7 branches. Between the exposed main trunk of the RHV and the cutting line in the ventral liver surface, which had been marked on the left of the tumor in the dorsal part of S8, the liver parenchyma was divided, securing the surgical margin for all 4 tumors in S7 and S8. Specimens were placed into a retrieval bag and removed from the umbilicus incision. Operation time was 341 min, and estimated blood loss was 200 g. Metastatic adenocarcinoma was confirmed by postoperative pathological diagnosis. The postoperative course was uneventful. The caudate lobe first approach in laparoscopic hepatectomy for S7 is feasible and can benefit anatomical resection in such procedures. The online version of this article ( https://doi.org/10.1007/s11605-018-4051-z) contains supplementary material, which is available to authorized users. Hongyu Li and Goro Honda designed study, prepared manuscript, and agreed on final draft. Yusuke Ome, Manami Doi, Jun Yamamoto, and Jun Muto helped to design study and agreed on final draft. Wakabayashi, G. et al. 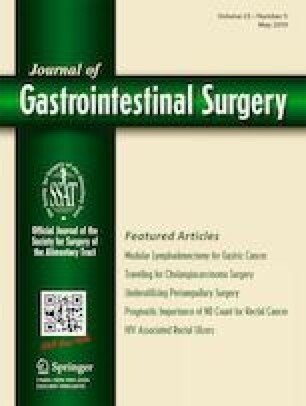 Recommendations for laparoscopic liver resection: a report from the second international consensus conference held in Morioka. Ann Surg 261, 619–629, https://doi.org/10.1097/SLA.0000000000001184 (2015).